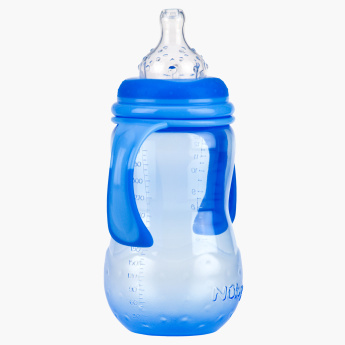 Nuby Wide Neck Feeding Bottle with Handle - 360 ml | Blue | Bpa free. Your little one can conveniently hold this feeding bottle and stay hydrated all day sipping from it. Crafted with two handles and a lovely shape, this piece will become his choicest.